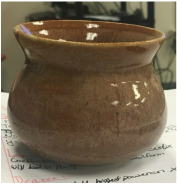 This is my second theme, I have a third project but i forgot to take a picture of it before i gave it away for Christmas The shape of it was the same as the lidded project except it had less of a lip. 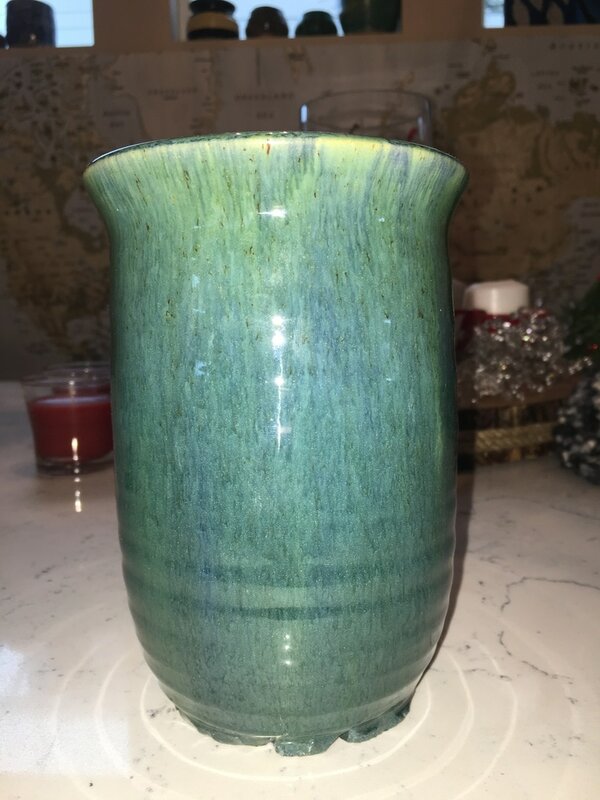 The glaze on it is bamboo on the inside and outside with a brushed line of red that turned out green. For my theme i choose to work on shape, my shape was round. The yellow vause was the first one i threw. It is thrown out of seamix and glazed with the yellow. It is a medium size pot with a happy vibe. The lidded is the second I threw it is cone ten and painted in bamboo and red that turned out green. it has a very earthy vibe. This is my second choice project. 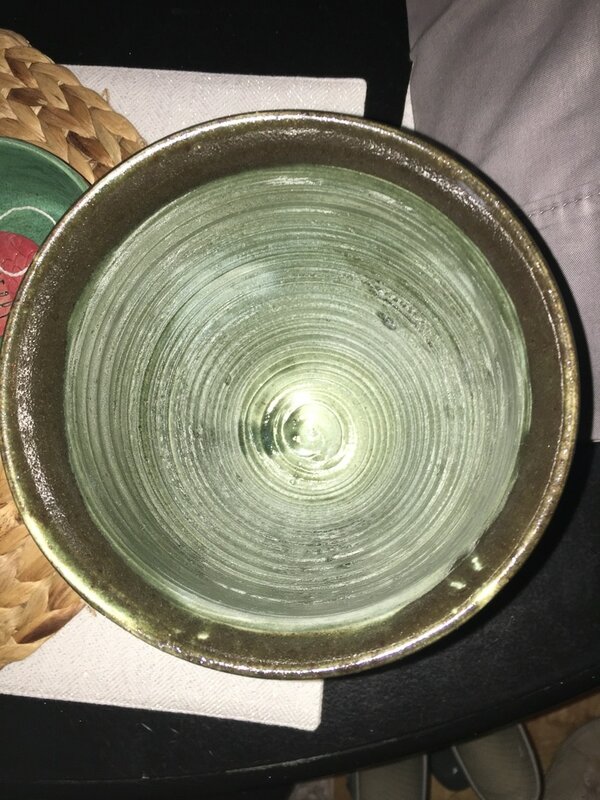 I tried to make the moon jar that was shown to me, but the shape was off. It should have been wider and shorter. The crack in the middle is because the bottom piece was much dryer than the top piece. But it doesnt bother me too much. I dipped the bottom half in matalic brown and the top half in black and got an earthy tone. This is my first choice project. It is just a basic mug that i shaped to my hand. When it was on the wheel i just through a cylinder and then grabbed it so it had form. For the glaze i dipped half of it in black and half of it in matalic brown. I'm really happy with the way it turned out. It gives me a very earthy tone which i like. These are two out of the three small bowls I made for my third theme. I decided to throw my last set small instead of large. I used simplicity for my theme because the bowls are very simple and for the glazes I just put them in white and them the top half in blue. The glaze on the bowl on the right got very messy because it started to run after I put it in the blue bucket. But it adds a state of uniquness. The overall mood is calm and simple. This is my double walled project. While i was throwing and attaching the walls, the project caved in and gave me this form. At first I wasnt sure that i wanted to still use this because it fell but I ended up liking it. The walls like this give it a unique look and adds movement and shape to the project. I put the holes in to show that it has two walls, but I am not sure what their use or purpose is. 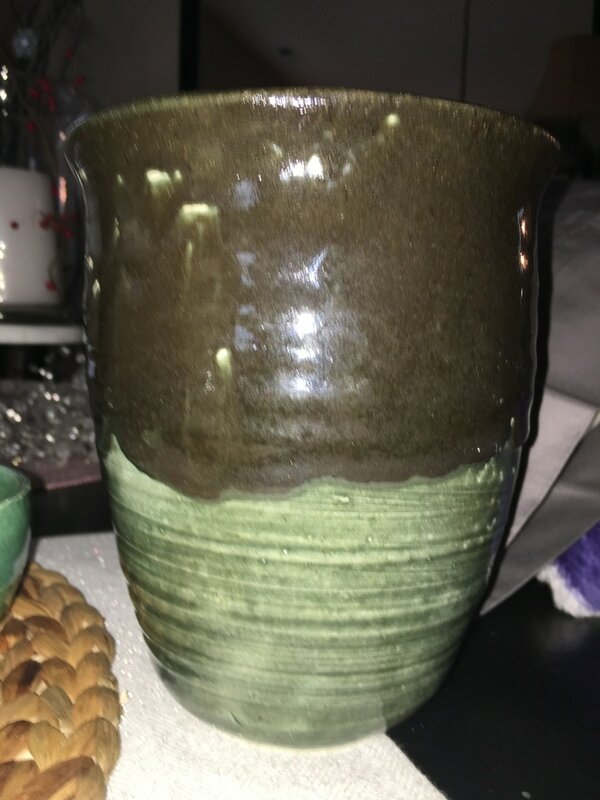 For the glaze, I dipped it in speckled Ivory and it reminds me of a darker bamboo glaze thats used for cone 10. This piece gives me an earthy relaxed tone. This is my multi wheel project. I chose to do a franken pot, and attached them while they were wet. This is probably my best attempt at attaching two peices together while they are wet. I love this vause, I wanted to do a subtle design but I couldnt figure out what I wanted to do so i tried to imprint a leaf. The stencil didn't press on all the way so i had to carve out the middle of the leaf. For glaze, I just dipped it in a blue and then wiped the glaze off from the leaf and coated it in clear. This vause gives me a simple and calm mood which I really like. This is my set of three. This set came together by accident but I still really like them. 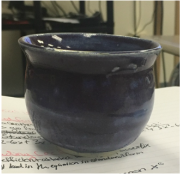 I made the purple one first with porcilin and it seemed to me like the perfect little mug. I put it on the bisqu shelf and forgot about it for the longest time. With what I thought was the shape I wanted in my head I threw the other two and realized that the shape was off and it wasn't going to be a true set. But I still like them as a set of small mugs. The mood of the purple one gives me a deep calming sense. The speckled on gives me a fun mood, and the brown one gives me an earthy mood. This is my team frankenpot finish. For this, Sydney made the base, I made the middle, and Zoe made the top. After the first day when everyone pulled their pieces I connected them together and tried to hide where the pieces came together but it was a little to dry to do so. 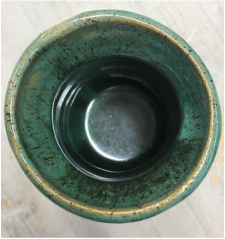 When the pot came out of the bisque Zoe went a head and glazed it with white and shadow green. 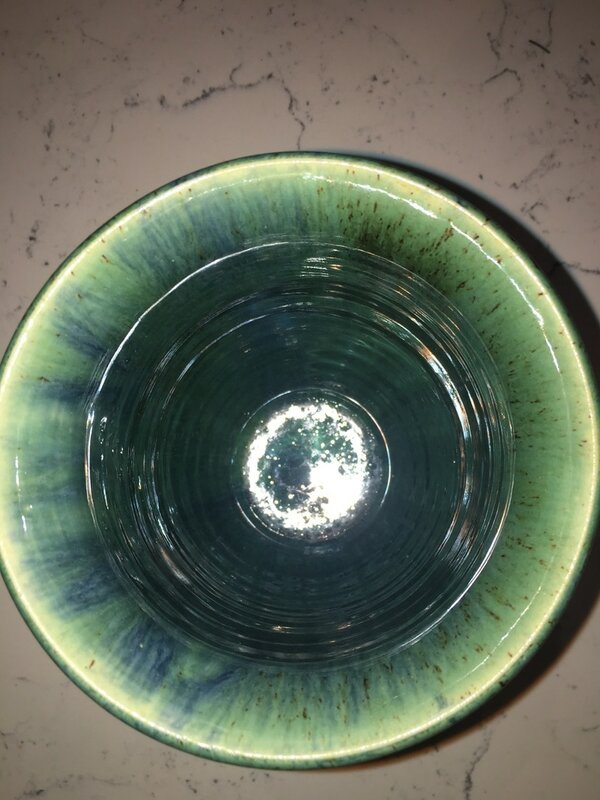 She dripped the shadow green on the outside of the pot and gave it a woodsy feel. 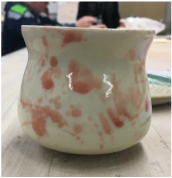 The drip glaze also gave it an elongating effect.